Browse: Home / 2017 / December / 12 / Part 9 The Llewellyn Casting Story Casting design # 2 # XLS. The Crescendo Lug set. # XLS. The Crescendo Lug set. (formerly called the “Slant 6 lug set” ) Year of introduction 2004. 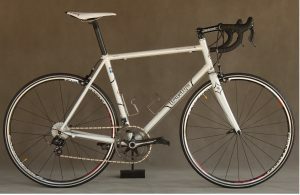 Llewellyn # XLS “Crescendo” sloping top tube lug set (formerly called “Slant 6”) was the world’s first sloping top tube lug set for road bikes for XL tube size (DOS) and the first Llewellyn frame lug set that I designed and produced. In 1992 I received my first Columbus MAX tube sets and this set with its bigger than ever before diameters became popular for track riders and road riders who are big, heavy and or tall. Recently the MAX tube set has a folklore legend grow around it which surprises me as there is nothing magical about the MAX tube set. The tube set had a lot more metal and a lot more grams so it felt very firm under the pedal, however one must remember that it arrived in the era of 28.6mm down tubes and even the larger 31.7mm down tubes had only just arrived so the 35mm MAX down tube along with a larger seat and top tube coupled with larger chainstays and bigger MAX fork blades was going to give a very firm frame and this became the new “magic feeling”. 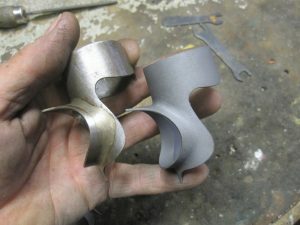 It was 2003 and Columbus had long stopped making MAX tubing and lugs and the left-over supply was finally drying up. With MAX fading I needed a replacement for the big, tall, or solid riders with all the desired features required for lugged construction in the first decade of the 21 st Century. After the enthusiasm and toil of the recently completed “Stem Lug Set” I soon started sketching again. I wanted to use a sloping top tube design for reasons of structural merit, (shorter tubes) and this can also allow the use of a taller head tube in frame designs for riders who need their handle bars higher. A bigger 36mm head tube to fit 28.6mm (1 1/8”) alloy, carbon or steel steerer forks and with XL tube diameters that are the same as MAX. 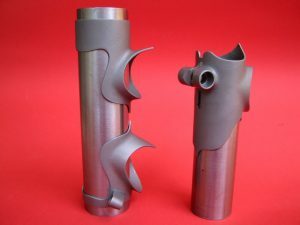 The shaping of the large MAX down and top tube to fit the older smaller head tube was of negative value to the frame, however with the 36mm diameter the lug set was to have round tubes throughout which is a plus for torsional rigidity. I settled on 6 degrees of top tube slope which is an angle that is useful but not so much as to make the frame look like a BMX bike. There was to be ample stack height on the top head lug so it could be trimmed to suit the frame design if required. The bottom head lug needed to have cast bosses for M5 gear cable adjusters with a counter bore for the adjuster spring to nestle into, so when turned it did not scrape and chip the paint off, thus helping to keep a neat and tidy appearance on the finished frame. Those old style seat binder bolts are just plain dreadful, so it will be a standard stainless steel M6 caphead bolt for the seat post binder boss. The top of the seat post binder keyhole slot was to have rounded corners to avoid digging into and damaging carbon seat posts and thus give a more gentle but secure waist type grip on the seat post. I also needed to design enough room on the lugs for reshaping of the shorelines or extra elaboration if so desired. I studied the tube maker’s available tubes for a useful selection of tubes. To have the seat post fit directly into the Columbus 31.7 seat tube a 30.60mm seat post was required, thus avoiding dreadful sleeves. My US agent at the time and I organised the manufacture of 30.60 seat posts in the USA. I did more sketches with my shoreline inspiration coming from a Bocama lug set from the 1980’s that I had used back then. 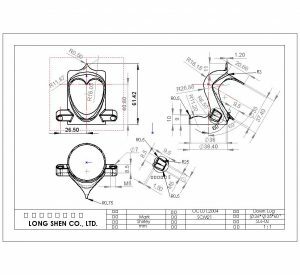 I then did the 2D CAD dimensioned drawings and LongShen again did their interpretation from my hand fabricated sample lugs to produce their 3D drawings, however there is a loss of interpretation from my samples to draftsman, then onto the tool maker and to the end result of the investment cast lug. No too bad but to my eyes it is there. 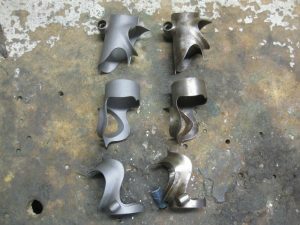 The first of these lugs castings arrived on my doorstep and to my European agent “Ceeway” and to my USA agent in late 2004. 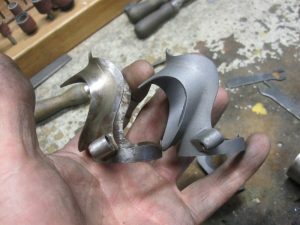 ← Part 8 Casting # 1 The Llewellyn Stem lug set.